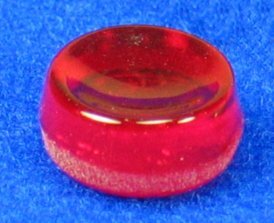 These medium glass bearings are designed specifically for use with standard sized Richard Glässer Pyramids but they may also fit and work with other brands. Single Glass Bearing - Made in Germany by RG Erzgebirgische Volkskunst Richard Glässer GmbH Seiffen 12-13mm in diameter - Color may vary This cup fits 90% of German Pyramids! These medium glass bearings are designed specifically for use with standard sized Richard Glässer Pyramids but they may also fit and work with other brands. 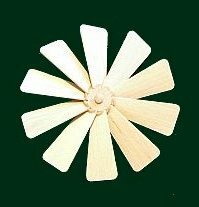 These are the same bearing as below - RG- 91012 but include the round wooden holder. 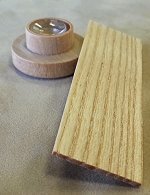 You also see listed a wooden support strip. This typically slides under the holder to lock it into position under your pyramid. 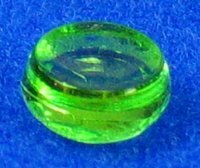 Single Glass Bearing & Holder Made in Germany by RG Erzgebirgische Volkskunst Richard Glässer GmbH Seiffen 12-13mm in diameter - Glass Color may vary Parts are sold separately - Please use drop down menu!